Prudence Pennywise: Do you Mastermind too? I am in the throes of a serious obsession. Don't try to help me because I don't want out. Yet. I haven't written and I won't call. There will be no homecooked meals or midnight movies or tidied rooms till this thing runs its course. It's Mastermind and Sailor got it for Christmas. She hasn't had a chance to touch it since except to set new codes for me. 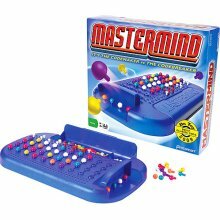 Have you ever played Mastermind? If not, don't bother unless you are willing to ignore your offspring, your hungerpangs, your Christmas decorations, and your blog. You've been warned. PS Play online right here. It's not quite the same as handling the candy-colored pieces in your hand, but it'll do till you can run to Target. PSS I'll be back with Jalapeno Popper Dip. You can dip with one hand while you play Mastermind with the other. I used to play as a little girl. Love it! Must bug my parents to dig it out for me. Would be fun to play it again. I remember this game. We used to have it when we were young. When you said you wanted Mastermind I thought it was a new game or even a book. We'll have to get this and try it again. It sounds like it could be a new obsession. Every girl needs an obsession...right! My family has suffered greatly (in their minds) numerous times because I have discovered a new "hobby". Have fun it is the holidays! You shouldn't show that to people who are supposed to be working. I used to play this game all the time when i was little! One of my all time favorites! Thanks a lot (sheesh). I just spent an hour playing this online instead of exercising and reading scriptures. Soooo addicting. You should be more careful what links you post with such weak minds like me reading this blog!